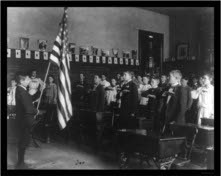 Where Did The Pledge of Allegiance Start? The Pledge of Allegiance is THE most recited ad campaigns in the US today. It started as a small pledge, written for a Christian, children's magazine that was trying to sell American flags. This was back in 1892, when they were celebrating the 400 year anniversary of the day Columbus arrived on American shores. The magazine had contracted a Baptist minister, Francis Bellamy, to write it. He wrote: "I pledge allegiance to my flag, and to the republic for which it stands: one nation indivisible, with liberty and justice for all." President Benjamin Harrison is credited with making it a part of the public school morning ritual...less than a year after it was first written. He proclaimed that children were to recite it during their observance of Columbus day on October 12, 1892.